Residential solar power takes many forms. It is as simple as installing a solar-powered motion-sensitive light in the driveway or as complex as contracting for a whole house solar power retrofit. New homes designed with solar power systems operate "off the grid" and save money and energy. Comfort controls for heating and cooling, large and small appliances and water consumption are the main energy-using systems in houses. Solar energy comes in many forms, is accessible and can be cost effective, paying for itself over time. PV, or photo voltaic solar power is what usually comes to mind when we think of solar power -- solar panels collecting the sun's energy and storing it in batteries for use as electricity. Other types of solar power include passive solar, solar heating, solar lighting and indirect solar energy, all different systems and equipment for using the sun's energy instead of electricity, natural gas or other fuels for home energy use. Passive solar energy systems collect the sun's light and heat without any mechanical devices, most commonly with design that is oriented to south-facing locations, sky lights to allow sunlight and natural light in, and materials that absorb the sun's heat and distribute it evenly. Solar heating systems use a collector to heat water for distribution to warm a building. Solar lighting systems use a collector to gather light and distribute it to provide light inside a building. Solar power in houses can be designed in the original construction or added to older structures by retrofitting with solar power systems. To entirely replace a house's traditional energy with solar power, an energy audit is required to know how much electricity, natural gas and hot water is used per month. With the audit information, you can figure out the best types and sizes of solar power equipment necessary to provide your monthly power needs, or plan to only partially replace energy needs with solar sources. Additional sources of alternative energy such as wind power, gray water systems and rain water collection are often used with solar power. Various solar power systems require different types of solar power equipment. Parabolic mirrors capture and redirect sunlight for solar lighting. Photo voltaic panels collect energy from sunlight and store it in batteries or generators for use as electricity or to heat solar water tanks for hot water. Thin film solar sheets collect solar energy for use in various ways. The costs of buying and installing solar power equipment depend on what kind of equipment you need, how you will install it, what vendors you work with and what kinds of rebates and incentives are available. Many factors apply to the design and cost of solar power systems. An energy audit and several estimates from various solar power contractors are necessary before you begin any solar power project. Research solar equipment vendors, state and federal incentives for alternative energy use, costs, and building and zoning regulations in your area. Talk to homeowners near you who use solar power to gain insight from their experience. Determine if it is more cost-effective for you to start small or contract for a whole-house retrofit project. Do the math and research before making any final decisions. 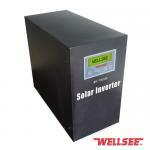 Solar inverters are an essential component of a home solar panel installation. There are four components to connect together: the solar panels, the charge controller, the batteries and the inverter. 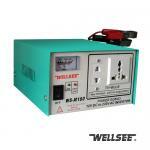 The charge controller is needed to make sure that the batteries are not overloaded. The inverter is needed to convert Direct Current (DC) to Alternating Current (AC). Most home appliances run on AC and the output from solar panels and batteries are DC. Firstly,Connect the solar panels together so that the voltage output will match the batteries. Connecting two panels (or similar groups of panels) in series will double the voltage, but keeps the current the same. Wiring two panels (or similar groups of panels) in parallel keeps the voltage the same but doubles the current. 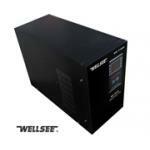 You should figure out the voltages for the panels and batteries so that they match before buying anything. You should also make sure that the ratings for the charge controller and the inverter match the voltages for the panel array and the battery bank before buying anything. Secondly,Connect the positive and negative outputs of the solar panel array to the positive and negative inputs to the charge converter. The positive and negative outputs or the charge controller are connected to the positive and negative terminals of the battery bank. Connecting two batteries (or similar banks of batteries) in series (the positive terminal of one to the negative terminal of the other) will double the voltage while keeping the current the same. Connecting two batteries (or similar banks of batteries) in parallel (both positive terminals connected together and both negative terminals connected together) will keep the voltage the same while doubling the current. Thirdly,Connect the positive and negative terminals of the battery bank to the positive and negative inputs of the inverter. The outputs of the inverter are connected directly to the house wiring. It is important that the voltage ratings to all four major components (solar panels, current controller, batteries and inverter) match. The panels and batteries can be wired in combinations that bring the total networks up to the required voltages--the networks need not be mirror images of each other as long as the totals match. If you are going to produce more electricity than you need, there are devices you can buy to put the excess electricity on the grid--the electric company will send you a royalty instead of a bill. Next： Designing your solar power system!